Have a question on 8 Series Convertible? Your review will help vehicle buyers make a better choice! 8 Series Convertible is available in 7 different colors - Black Sapphire, Grey Metallic, Blue, Alpine Whte, Mineral White, Sunset Orange and Blue Stone. The flagship convertible car from BMW, the 8 Series Convertible, has shown in recent times what BMW has got best in its offering list. The 8 Series Convertible is by far the longest, widest, most luxurious and tech-packed car BMW has ever offered till date, justifying its flagship positioning. BMW is offering the 8 Series Convertible with eight exterior paint schemes, six alloy wheel designs, five upholstery options, and four interior trim levels. The overall interior theme of the 8 Series Convertible too is something which can be easily regarded as a fresh lease of change. The layout is something different from the BMWs of the past and needless to say, has got oodles of luxury appeal. While the three-spoke steering wheel with buttons for audio, cruise and other functions is the same as that on the M series of BMWs, the full TFT instrument console is something new and very tempting to look at. Same can be said about the all newly designed center console, which looks wide and unlike other BMWs, is not driver centered. It does get a new touchscreen infotainment system with BMW’s iDrive technology in its best possible form. The buttons for automatic climate control too look minimalist but nice and premium. The space for rear seat occupants is quite low due to limited legroom and kneeroom, given the two-door layout. BMW does offer a total of five upholstery options – Ivory White, Cognat, Black, Night Blue with Black, Tartufo with Black and Fiona Red with Black. Also on offer are four trim levels for door panels and center console to add to the premium appeal. BMW, in recent times, has come up with some really tempting new-age design themes, and the 8 Series Convertible is one perfect epitome of it. Going by the dimensions, the 8 Series Convertible is the longest and widest convertible car BMW has ever produced, giving it a perfect sporty stance. At the front, the traditional double kidney grille on the 8 Series Convertible looks bigger and tapered from the outer edges. This grille, along with the sleek and curvy full LED headlamps give the 8 Series Convertible a sporty front fascia. The front bumper has got sporty looking air dams on the corners like every other M range offering from BMW. From the side, the elongated profile of the 8 Series Convertible gives the car a luxurious and elegant feel. This only doubles up due to the low slung stance, two door look and large 20-inch alloy wheel options – there are a total six on offer! At the rear, the BMW 8 Series Convertible looks slightly different from other higher priced BMWs, due to its license plate positioning on the rear bumper, This gives the rear boot a clear and uncluttered design, which along with the sleek rear LED tail lamps give the car a sporty stance. Being an open-top grand tourer, the 8 Series Convertible keeps comfort at a higher priority. However, that doesn’t mean that BMW has sacrificed on the aspect of spot-on driving dynamics, its best trait. 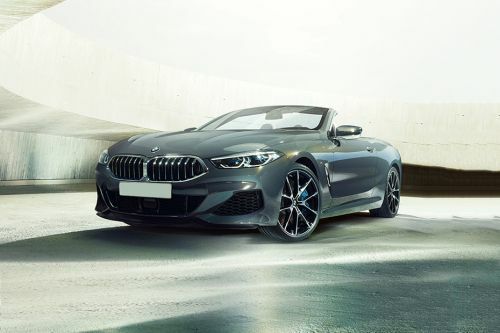 The 8 Series Convertible is being offered with all the top-of-the-line hardware, which includes Adaptive M suspension, Active Roll Stabilization, Integral Active Steering, M Sport Braking System, and Driving Stability Control and BMW xDrive intelligent all-wheel-drive system. Being the flagship convertible, it is quite expected that the 8 Series Convertible gets the most powerful engine options from BMW, and it rightly gets. On offer for UAE market is the top-spec M850i, which has got a 4.4-litre twin turbo V8 petrol engine. This engine, mated to an 8-speed automatic transmission, pumps out a maximum power output of 530 PS and a peak torque output of 750 Nm, making it the most powerful BMW car out there. Apart from the regular safety kit like airbags all around, ABS with EBD, traction control and vehicle stability control, the 8 Series Convertible also gets Active Cruise Control, Steering Control Assistant, Lane Control Assistant, Active Side Collision Protection, and the Crossing Traffic Warning System. The 8 Series Convertible proves that it deserves to be the top-of-the-line BMW in every aspect – be it design, performance, driving dynamics or the number of technologies and features on offer. It surely ups the ante of BMW and gives a whole new definition to luxury on four wheels. What is the price of BMW 8 Series Convertible? On road prices of BMW 8 Series Convertible M850i xDrive in is costs at AED575,000 . What are the colors options available in BMW 8 Series Convertible?